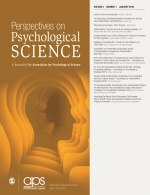 Perspectives on Psychological Science is a bimonthly peer-reviewed academic journal of psychology. It is published by SAGE Publications on behalf of the Association for Psychological Science. The journal was established in 2006 and the editor-in-chief is Laura A. King (University of Missouri). The founding editor was Ed Diener (University of Illinois at Urbana-Champaign). Members of the Association for Psychological Science receive the journal as part of their membership. According to the Journal Citation Reports, the journal has a 2017 impact factor of 9.305. ^ "Perspectives on Psychological Science". 2017 Journal Citation Reports. Web of Science (Social Sciences ed.). Thomson Reuters. 2017.